Those looking for hope amid tragedy will be heartened by president Emmanuel Macron’s assurance that the French will “rebuild together,” and the fundraising efforts that reached $670 million within 24 hours of the blaze taking hold. As with any fire-damaged building, safety will be the principal concern. 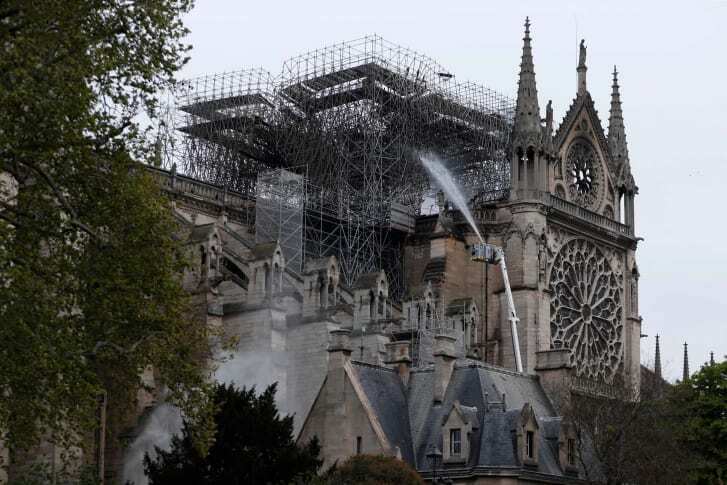 The main structure (and two bell towers) may have been “saved and preserved,” according to French authorities, but parts of the cathedral could still be at risk of localized collapses and falling debris. Before distinguishing between the salvageable from the unrecoverable, immediate steps will need to be taken to prevent further damage, according to architectural historian and broadcaster, Jonathan Foyle — not least, a temporary roof. “It’s already a wet building because of the water that’s been pumped on it, so they’re going to need to provide some kind of cover from the elements,” he said in a phone interview. That’s no small task in itself, said the head of the Group of Companies for the Restoration of Historic Monuments in France, Frédéric Létoffé, “This will require a lot of work since, beyond shoring and reinforcement, it will be necessary to build a scaffolding with an umbrella to be able to cover the entire roof that went missing, to ensure protection against weathering” he told reporters in Paris. The first priority for restorers will be installing a temporary roof on the building, according to architect John Burton, a surveyor of conservation works at other English Gothic churches Canterbury Cathedral and Westminster Abbey. This will help experts carry out a detailed inspection of the site — in particular, how much of the structure is secure. “Gothic structures are all about balance,” said Burton. “The building stands up by all the components being compressed together.” The flying buttresses that once carefully supported the entire building could now be out of balance, he said. After protecting the building’s remains, restoration teams will begin assessing the level of damage. That process itself could take years, he said. “The stripped roof and upper masonry will reveal aspects of the building’s history which probably haven’t been understood,” Foyle said. “Notre Dame has virtually no building records. We know (that construction) started in 1163 and was basically completed by about 1240, but there are no building accounts. Peter Riddington, an architect at Donald Install Associates, who worked on the restoration of Windsor Castle after it was damaged by fire in 1992, suspects one of the more immediate steps will be to carry out some archaeological work. “What was extremely useful for us (at Windsor Castle) was there was an archaeological sift of debris,” he said during a phone interview. Investigators might decide to divide up the floor area into a grid, and assign a team to sift through every square, Riddington said. They’d pick up anything that might be useful — either items to reuse in the build or to be copied to make models. “This sort of process could surface thousands of trays full of valuable debris and objects,” he said. Once the “forensic” part is over, Burton said, specialist committees will likely be set up to assess each of the elements — from stained glass to gold plating. It will then be down to a master architect to bring the overall design together. The goal of restoration is not always to replicate the past. Modern tastes and technologies may influence how damaged structures are re-imagined. Take, for instance, the recent restoration of the Cutty Sark, a 19th-century British clipper, renovated at a cost of £50 million ($65 million) following a devastating blaze. A contemporary glass structure, housing modern facilities, was added to the base of the vessel, a tourist attraction in London. Authorities may wish to stay faithful to earlier renditions of cathedral. But it’s also possible that France takes a bold new direction with one of its most iconic national monuments. Indeed, the spire that collapsed to gasps from stunned onlookers Monday evening, was itself a break from the past, having been built during a sweeping 19th century restoration. Its designer, the architect Eugène Viollet-le-Duc, made his spire taller and more elaborate than one that had existed previously. Many skilled laborers and craftspeople including masons, carpenters, joiners and carvers will all have to be recruited to work on this large-scale project.